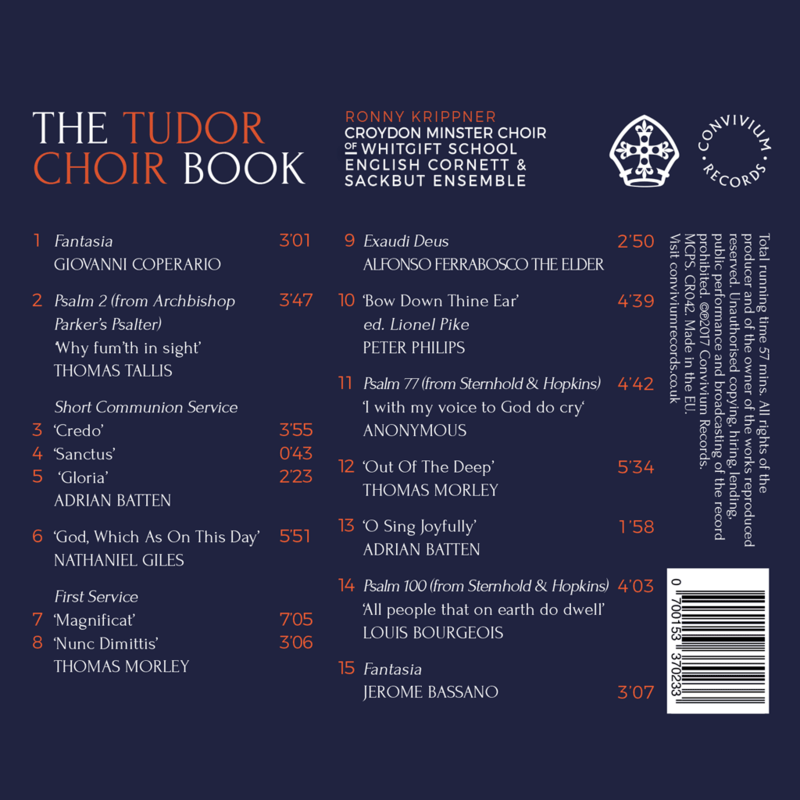 The album includes rare recordings of Tudor instrumental items by Coperario, Bassano and Ferrabosco, captured on period instruments, as well as choral greats from Tallis, Batten, Morley and Phillips, performed by the Croydon Minster Choir of Whitgift School, accompanied by the English Cornett & Sackbut Enesmble and directed by Ronny Krippner. Another metrical psalm, which caught Vaughan Williams’ attention early on in his career, was Thomas Tallis’ Phrygian melody to Psalm 2, published in 1567 in Archbishop Parker’s Psalter. This wonderful modal tune was the inspiration for Vaughan Williams’ iconic work, Fantasia on a Theme by Thomas Tallis, written in 1910. Adrian Batten (1591–1637) was organist, singer and composer at Westminster Abbey and St Paul’s Cathedral. His Short Communion Service is surprisingly plain and simple in style, yet full of grace and dignity. This was probably to please evangelical sensibilities who wished liturgical music to be “modeste and destyncte”, able to be “playnelye understanded, as if it were read without singing” (Royal Injunctions of 1559). Another reason for the simple homophonic style of Batten’s setting could be the low status of the service of Holy Communion itself within the Anglican Church at that time. In 1563, for instance, the celebrations of communion were reduced to one a month at Canterbury Cathedral and were usually “dry”, meaning that they ended after the creed. The contrast between Batten’s simple Communion setting and Thomas Morley’s First Service is plain to hear, as Morley’s composition is poles apart from the simplicity prescribed by Archbishop Cranmer a generation earlier. Morley (1577–1602), who was organist at St Paul’s Cathedral and a pupil of William Byrd, displays a real mastery of counterpoint and melodic writing in both his Magnificat and Nunc Dimittis. The Royal Injunctions of 1559 not only encouraged simple evangelical music, but also catered for the “comforting of such as delyte in musicke”, and allowed for “the best sorte of melody and musicke that maye be convenientlye devysed.” This sort of statement is typical for the Anglican via media in regards to music; both plain and more elaborate styles were deemed acceptable. However, being a publicly-practising Roman Catholic in England at that time was not acceptable, and, for this reason, Peter Philips (1561/62– 1628) was forced to leave his home country and settle in Brussels, where he was organist to the chapel of Albert VII, Archduke of Austria. Philips was an extremely prolific composer, whose sacred choral output was intended for Roman Catholic worship and, as a result, set to Latin texts – which made performances in Protestant England impossible. Bow Down Thine Ear is a contrafactum (text substitution) for Philips’ madrigal Cantai mentre of 1596, possibly arranged by one of Philips’ English colleagues, such as Thomas Morley. These extreme chorister recruitment measures ensured high-quality music-making for the Chapel Royal, and enabled it to play a key role in nurturing English church music. 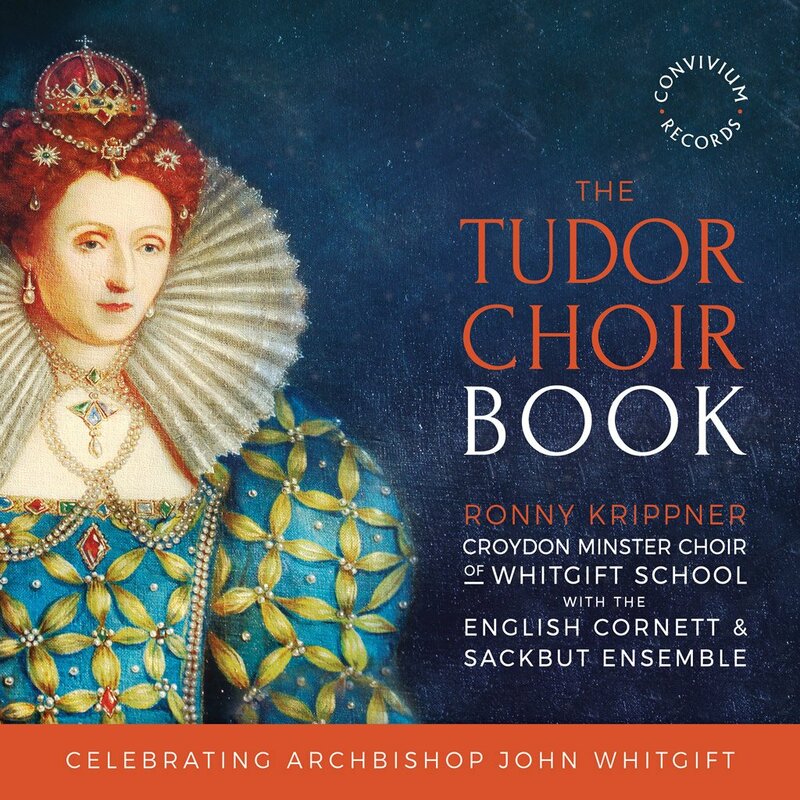 Archbishop John Whitgift (1530–1604) The anthem God, Which As On This Day, based on the Collect for Whit Sunday, shows Giles as a most competent composer of choral music, written in the English verse anthem style. Although he is not exclusively commenting on the state of music in the English Church, it is reasonable to apply Willis’ comment to the state of church music in cathedrals at that time. 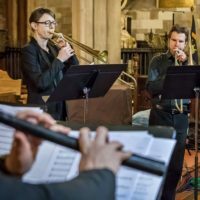 Two of the instrumental items recorded on this CD (Bassano’s Fantasia and Ferrabosco’s Exaudi Deus) are taken from partbooks known as Fitzwilliam 734, which used to belong to the cornett and sackbut players in the employ of James I. It is possible that Fantasias of that style served as ceremonial music at Canterbury Cathedral and would have certainly added to the sense of occasion during Whitgift’s regular visitations as Archbishop. The Choir of Whitgift School is based at Croydon Minster, which is deeply rooted in the Anglican choral tradition. It boasts over 70 singers in its four choirs: the Choir of Boys & Men, the Girls’ Choir, the Choral Scholars and Lay Clerks. There are five choral services each week during term time, as well as regular concerts throughout the year. All choirs have toured, broadcast and recorded. Over the years, the Minster has developed strong links with Whitgift School and the School has now become a major part of the Minster’s rich choral programme. 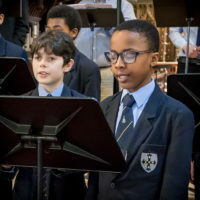 More than half of the Minster boy choristers attend Whitgift School where they receive a Minster Choristership carrying a remission of day fees of 10%. Whitgift also provides postgraduate Organ and Choral Scholars, as well as professional Lay Clerks to sing regularly with the Minster Boys’ Choir, enabling the Minster to run a busy schedule of cathedral-style choral services. Ronny Krippner is Organist and Director of Choral Music at Croydon Minster and Whitgift School (London). Born in Bavaria, Ronny is in the unique position of having been formed in both the German and British choral traditions. 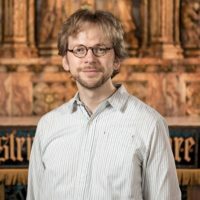 He studied organ playing and improvisation with Prof. Franz-Josef Stoiber at the Hochschule für Kirchenmusik in Regensburg while at the same time working as Assistant Choirmaster of the Regensburger Domspatzen” (“Regensburg Cathedral Sparrows”), Regensburg Cathedral’s famous boys’ choir. After graduating, Ronny went to Exeter University to take his master’s degree (M.A.) in “English Cathedral Music” whilst singing in the Cathedral Choir as a Choral Scholar. Building on these twin musical foundations, Ronny went on to take up various organist posts, including St George’s Church Hanover Square in London. Being fascinated from an early age by organ improvisation, Ronny has made this a specialism. Finalist in the prestigious Organ Improvisation Competition in St Albans in 2009, he won two Prizes in the International Organ Improvisation Competition in Biarritz in the same year. From 2010-2013, Ronny was Specialist Lecturer for Organ Improvisation at Birmingham Conservatoire and Trinity Laban Conservatoire, London. Ronny has recorded several CDs of organ and choir music and has frequently been heard performing on television and radio, both in Germany and the UK. He has given organ recitals in Germany, Holland, Belgium, the United Kingdom, the United States, Mexico and Australia. Psalm 77: I with my voice to God do cry - Anon.